“CAI fills a neglected niche in the music scene that has long been deserving of more attention. dedication and high standards of its organizers. “This competition was an incredibly valuable growing and learning experience. The judges’ comments, shared with each competitor, are helpful and instructive, the staff is so friendly, and the competition is so well-organized. 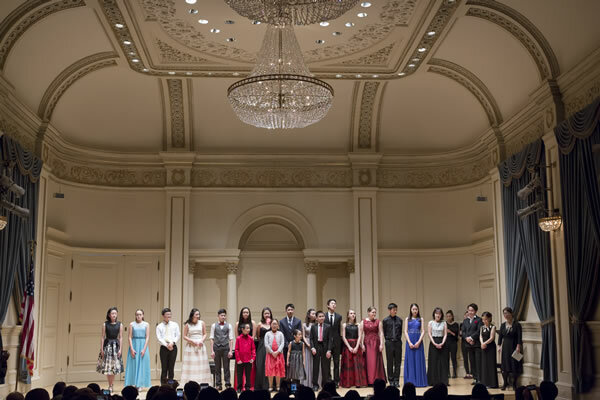 It is not often that young performers today are gifted with the priceless opportunity to perform at a world famous performance space such as Carnegie Hall. Concert Artist International is more than just a competition, it is a community of musicians that cares deeply about fostering growth and inspiration in developing musicians today. Accessibility to performing in these concert halls is now a possibility and a dream that can be fulfilled thanks to this wonderful competition and organization. I hope that many more young musicians will have the chance to take advantage of this rare competition, and to appreciate the new ecosystem and environment that it is creating in our classical music world. Carnegie Hall poster are personalized with performer’s bio and photos. CAI has obviously put a lot of thought and expertise into designing it. What a glorious, wondrous, amazing, magnificent, and mesmerizing concert that was!! all for your dedication and devotion for hosting this competition. to showcase their talent in an international venue. Our 8 year-old daughter had an amazing unforgettable experience playing at the winners’ concert in Carnegie Hall. especially Carolyn, were very professional while providing a personal touch to all interactions. “My heart was pounding with excitement every moment. from all around the world in an awe inspiring venue, Carnegie Hall. "Going to the CAI concert was my first time at Carnegie Hall. I was pretty excited, but also quite nervous. That all faded away though when I met Dr. Oh, the director. She was very kind, made us feel right at home, and even gave us some snacks to munch on. Everyone was really nice, and there was a friendly person I could talk to before she escorted me to the door to the stage. My parents thought the concert was organized very well and were very satisfied. Thank you to all of the CAI staff who dedicated their time to this competition and made this unforgettable experience real." “Our son Daniel truly enjoyed performing in concert with so many talented musicians. It was a privilege to perform at one of the most prestigious music halls in the world. and I learned various vocal skills, which were invaluable. 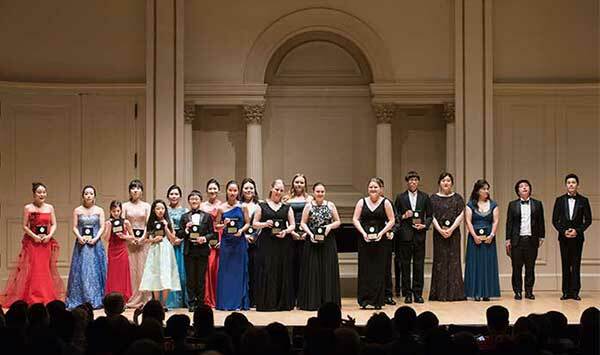 In addition, I was also very pleased to be able to sing at Carnegie Hall, as a winner of the CAI Strings, Voice, Piano Competition. “Thank you for the wonderful opportunity. Abigail had an amazing experience she will cherish her whole life! “How thrilling to see my students and other young artists performing on the stage of Carnegie Hall! “Our daughter Nana had a wonderful, treasured experience playing in the winners’ concert at Carnegie Hall. That experience gave her confidence and strong aspiration to become a professional player. “The CAI experience was unique and one of a kind. It made me perform at my highest levels and created meaningful friendships. To perform at Carnegie Hall and Strathmore Mansion was a memorable experience that I will never forget. I can attest to the importance of having world class performance experiences. “CAI provided a rare opportunity for me and my son to perform with professional musicians. It was a truly memorable experience. opportunities for emerging and established musicians. “Having a chance to perform at Concert Artists International was an amazing experience. Given that this was my first big competition, it definitely made a huge impact on me. “CAI is a wonderful combination of artistry and education. Walter Kruppa, Ph.D., Research Engineer, ret. organizers who are themselves musicians and teachers of the highest standards. Norman Holly, International Development Economist, ret. “CAI was a unique experience and a different approach to music competitions. "It is our honor to be part of your event." “The talent of the prize winners caused a warm heartfelt response…everyone left a pleasant impression! “CAI gives an amazing opportunity to perform in a prestigious and wonderful place – Carnegie Hall. More importantly, the Competition appreciates and promotes real values – music and passion. to move forward in my career. Although I felt a bit anxious preparing for the competition, when I got to New York, I felt so fortunate to participate in the amazing masterclasses taught by the incredible teachers Rick Christman and Ruth Falcon. Before this CAI experience, I was always insecure about my voice, but learning from these amazing artists and receiving constructive criticism and praise from them, I learned so much and gained confidence in my talent. They gave me the evaluation that I have a great voice but need to work on certain techniques. They encouraged me to keep studying and further develop my talent. I sincerely thank CAI for giving me the courage to move forward in my career. Thanks to CAI, I received a once in a life invitation to study with one of the best teachers in one of the best music schools in the U.S. Performing at Carnegie Hall was such a sublimely blissful experience, and I will never forget this amazing feeling.